There are two kinds of BASIC Stamp prototyping boards that you can consider for your electronics projects — a BASIC Stamp HomeWork board and a BASIC Stamp Board of Education. 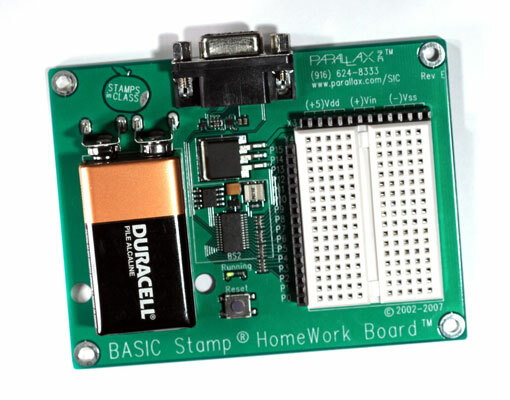 A BASIC Stamp HomeWork board is a prototyping board that includes a BASIC Stamp 2 microcontroller, a small solderless breadboard, a clip for a 9 V battery, and a connector for the USB programming cable. The chips near the center of this board constitute the BASIC Stamp 2 module. On the left is a battery clip to which you can connect a 9 V battery for power. On the right is a small solderless breadboard, consisting of 17 rows of solderless connectors. Immediately to the left of the breadboard is a row of 16 connectors that provide access to the BASIC Stamp 2’s 16 I/O pins, and immediately above the breadboard is a row of connectors that provide access to +5 V (identified as Vdd and Vin on the board) and ground (identified as Vss). 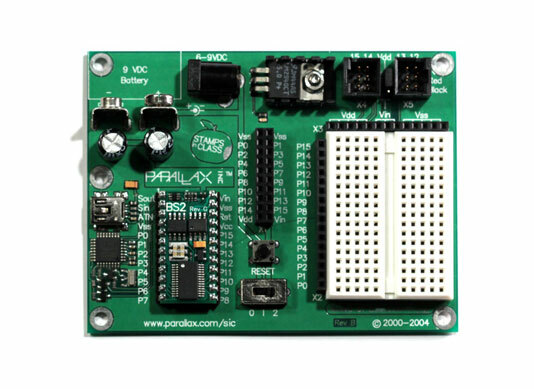 This breadboard is designed to allow you to construct simple circuits that connect to the 16 I/O pins. This allows you to connect pushbuttons and other devices that can send input to the program running on the Stamp or LEDs or other output devices that the Stamp program can control. A prototype board similar to the one on the HomeWork board. A special 20-pin connector that allows you to permanently connect external circuits to the BASIC Stamp’s 16 I/O pins. This is useful if you want to build circuits that are more permanent than the solderless breadboard allows. Special connectors for I/O pins 12, 13, 14, and 15 that are designed for connecting the BASIC Stamp to servos. A 9 V battery clip and an external power connector that allow you to power the BASIC Stamp with either a 9 V battery or an external power supply. A removable 24-pin BASIC Stamp 2 Module. This allows you to use the Board of Education to program the Stamp. Then when you’re certain that the program is working properly, you can remove the BASIC Stamp 2 Module from the Board of Education and plug it into your own circuit.